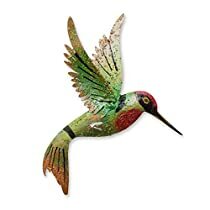 About this item: Crafted by hand, this dazzling hummingbird features cutout motifs to define its lovely plumage. J. Blas works in iron to create the petite wall sculpture. In Mexico, when someone sees a hummingbird in flight, he or she makes a wish. Exceptional Artisan Quality by J. Blas - crafted with care to be treasured for years to come. Beautiful product and such a good value for an original work of art. Very pretty, it looks just as the picture. Product much better than picture depicts.